Why Use Kale in Smoothies? Kale is a bit underappreciated. Perhaps because it doesn’t taste as great as its rival spinach. Kale has a somewhat bitter taste whereas spinach has a much more neutral taste which is naturally more appealing. Spinach is also easier to cook nice meals with and you’ll find many more recipes with spinach than with kale. In addition, raw spinach can easily be added to salads, but you wouldn’t do that as easily with kale. This is a pity because kale is such a nutritious vegetable. Looking at the nutritional profile of kale, it’s clear that this leafy green is a particularly rich source of vitamin A, folate, vitamin C and vitamin K. The amount of vitamin K in 100g of kale is equivalent to almost 700% of the daily value! In addition, kale is also a good source of protein and dietary fiber. Kale is also super low in calories and has zero fat, so if you’re trying to lose weight, this leafy green is your friend. Make sure to read my tips to help you blend kale the right way, so you can get that smooth texture without the chunky bits. And mixed with the right ingredients, kale is the perfect leafy green to include in your smoothies. Here are 8 recipes for delicious and super healthy green smoothies with kale as a key ingredient. Keep in mind though that all leafy greens are a great source of different nutrients, minerals and vitamins. It’s important to mix up the ingredients regularly and not stick to just one or two vegetables. Variation is key! The following kale smoothie recipes are pretty easy to prepare, without any exotic or hard-to-get ingredients. Feel free to experiment with some of the ingredients to give it your personal touch. You’ll be surprised at how tasty a kale smoothie can be! 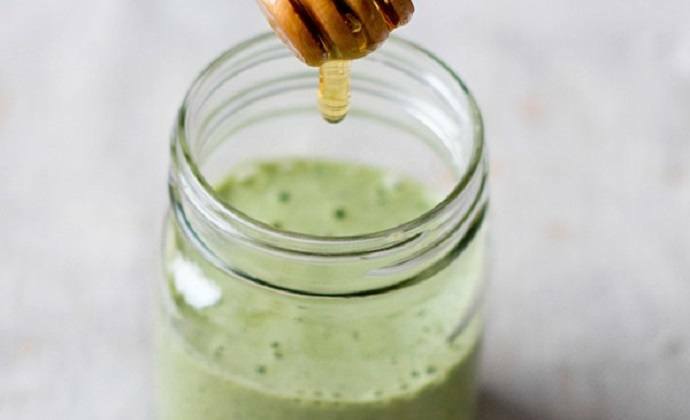 This fruity vegan detox green monster smoothie recipe is a delicious mix of all the right fruits with kale leaves and vanilla almond milk for extra flavor. Cucumber is another underappreciated ingredient to put in your smoothies. With its high water content, cucumber is very easy to blend and a great alternative to plain water. For additional flavors, you can experiment with ingredients such as peanut butter, blueberries, ginger or lemon. Diana over at The Chic Life has come up with a more exotic recipe which includes a bit of papaya. To be honest, I had never tried blending before until I stumbled upon this kale smoothie recipe, and I love it. Papaya is loaded with vitamin C, antioxidants and other goodies. 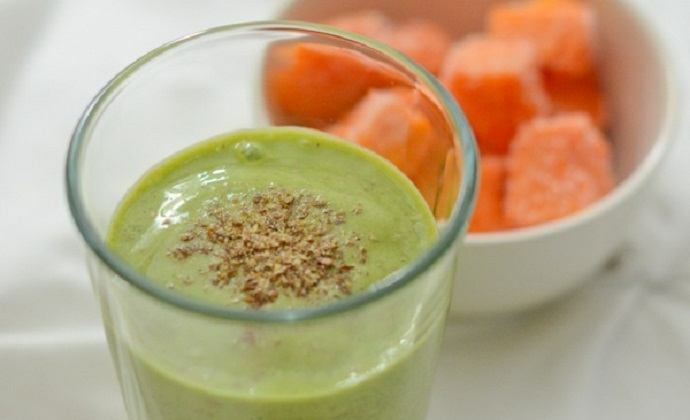 This recipe with papaya and kale mixed with almond milk, banana, ground flax seed and honey is very refreshing as a dessert. The Himalayan salt is an interesting optional ingredient, but works quite well to counteract the sweetness. Looking for an easy way to detox after a tough night out or an indulging holiday? 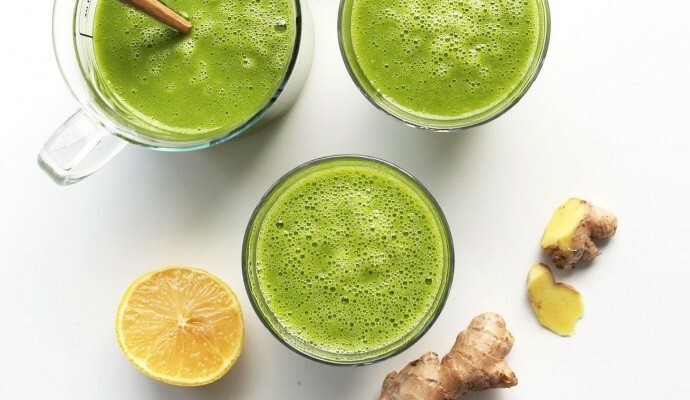 This surprisingly delicious kale ginger detox green smoothie recipe is worth a try! The combination of kale, ginger, blueberries and cinnamon make this recipe an absolute winner. So many flavors in all the right places, not to mention the great variety of different nutrient you get to absorb when drinking this delicious smoothie. Even if you’re looking to detox, please do try this kale smoothie recipe, you won’t regret it! Note that with the frozen ingredients, it may be worth using the pulse button if your blender has one included. Declared by Spoon University as the best green smoothie ever, I couldn’t resist trying this kale smoothie recipe out for myself. I must say, this smoothie is indeed a winner. Perhaps not the best one I’ve ever made, but it’s up there! Perfect for a quick and healthy breakfast, this powerhouse smoothie with kale, pineapple, avocado and coconut water is an absolute delight, packed with a great amount of nutrients. If you need a bit more protein in the morning, add some protein powder to complete this recipe. I actually tried this recipe twice, but the second time I also blended the avocado seed. Yes you can eat that too! Few know about the powerful health benefits of chia seeds. Loaded with iron, magnesium, calcium, protein and omega-3 fatty acids, these tiny little seeds sure pack a punch. One way of consuming chia seeds is to simply add a teaspoon to your green smoothies. This kale smoothie recipe with pineapple, coconut milk and apple also includes chia seeds for extra nutrition. It’s a very simply yet clever smoothie that will satisfy your taste buds at any time of the day. Hemp seeds are another great vegan protein source that you can easily add to your green smoothies for a quick protein boost. 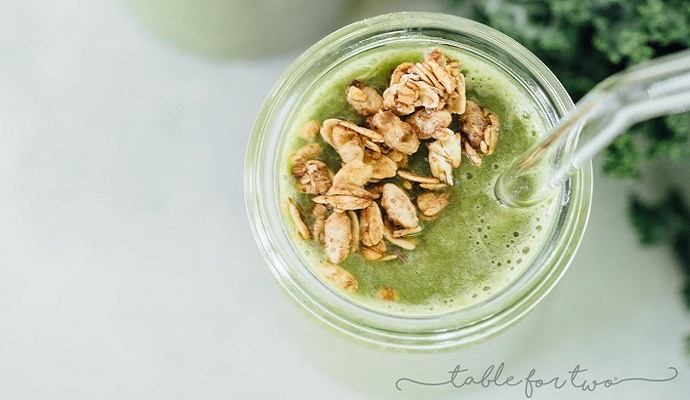 This simple but delicious green kale smoothie recipe by Blissful Basil does exactly that! The sweetness of the banana and almond milk works brilliantly with the bitterness of the kale. For even more sweetness, add some pineapple chunks or an extra banana. Perhaps a teaspoon of honey will work well too. 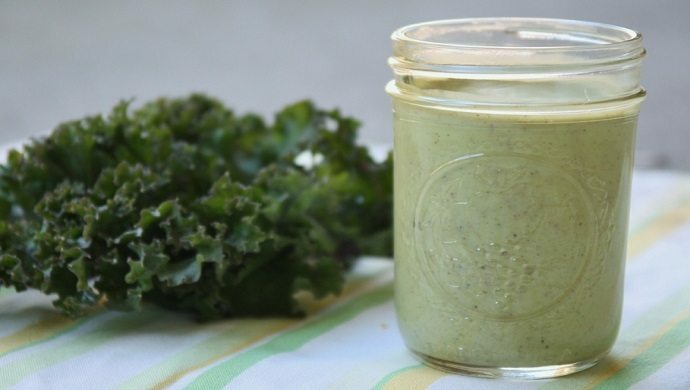 Definitely my favorite one in this list of kale smoothie recipes, this TropiKale (great name!) green smoothie combines four delicious fruits with kale and coconut water. Breakfast will never be the same again after drinking this one! Since this is a very fruity recipe, you can easily add some more greens for a better balance between fruits and vegetables. Spinach and perhaps a bit of parsley are great candidates. Ginger and lemon are two ingredients I almost always add to my smoothies. Both of them are incredibly nutritious and they add very strong flavors to green smoothies. This smart recipe by the Minimalist Baker combines ginger and lemon with kale, mango and peaches resulting in an absolutely delicious and powerful drink. The marble syrup is an optional ingredient, depending on how sweet the fruit comes through in the smoothie. I personally didn’t feel the need to add it in as the flavors were just perfect.